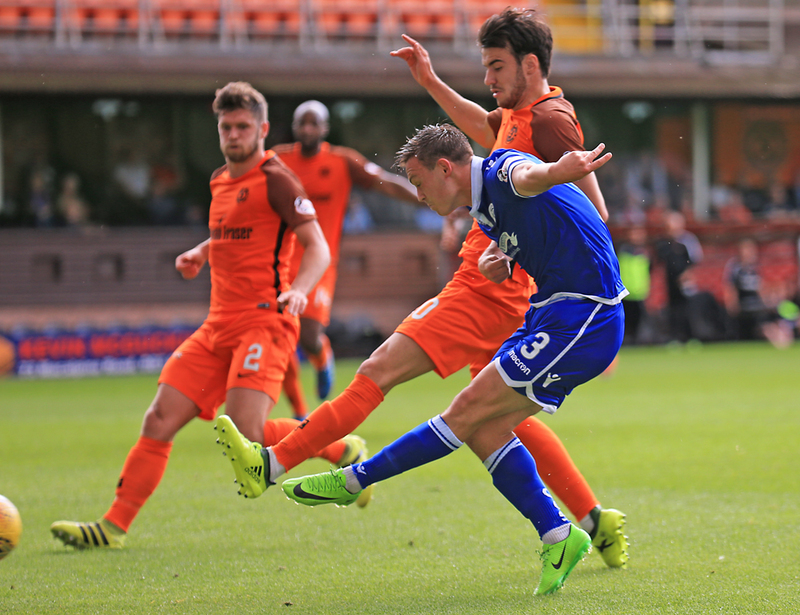 QUEENS suffered their first defeat of the season in a feisty 2-1 defeat at the Championship`s bookies favourites Dundee United. Hitman Scott McDonald gave the hosts an early lead before Callum Fordyce levelled. United went down to ten men when Paul McMullan raised his hands on the half hour mark. Despite several chances from the visitors it was United who wrapped the three points up when substitute Scott Fraser placed a shot past Alan Martin. Gary Naysmith`s men came into the game top of the Championship summit after their comfortable 4-1 victory over Brechin at Palmerston. 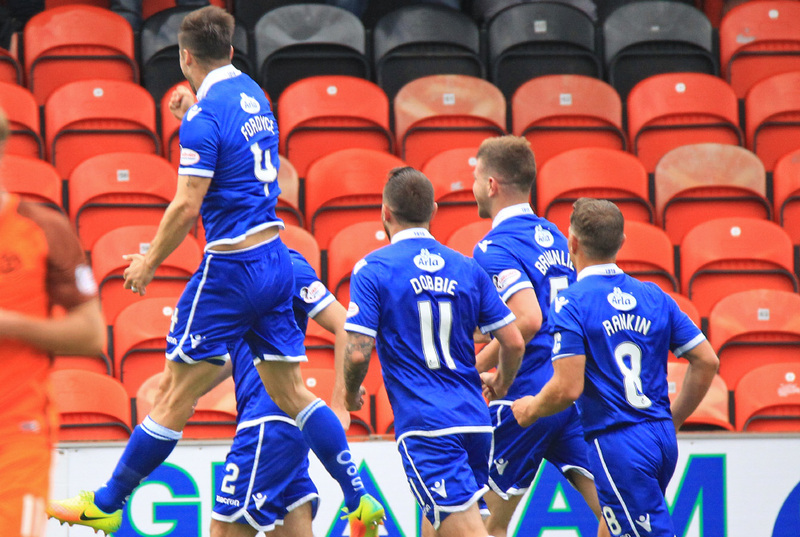 Queens were undefeated in their two trips to Tannadice last season. 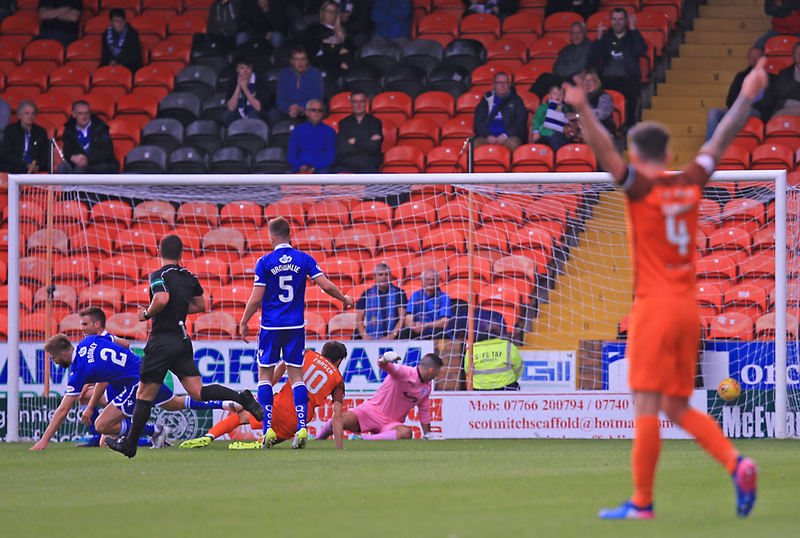 An opening day 1-1 draw and a 3-3 classic meant the Doonhamers went home with a share of the spoils. Queens made two changes to their starting line-up, Callum Tapping and Stephen Dobbie, who was out last week with back spasms, returned in place of wingers Connor Murray and Dan Carmichael, who dropped to the bench. New St Johnstone loan additions Chris Kane and Jason Kerr were on the bench. 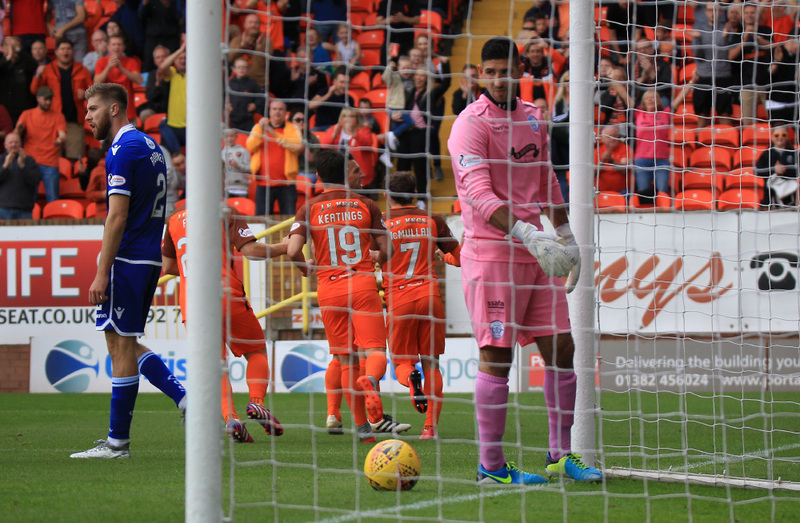 Goalkeeper Martin shrugged off the injury he sustained last week and started for the Doonhamers. The visitors started brightly when Tapping played through Dobbie on three minutes. The striker delayed pulling the trigger and a United defender blocked the attempt. There wasn`t too many chances to report on in the opening exchanges until a curling effort from Jamie Robson on the left cracked Martin`s left-hand post on 16 minutes. It was a warning for Queens as United were finding easy pickings on the left hand side and Ray McKinnon`s men used it to full advantage. Paul McMullan, who was causing Shaun Rooney plenty of problems on the left, used his skill and pace to deliver an inch perfect cross to McDonald, who simply tapped home from close range to score his first goal for the Terrors on 18 minutes. The lead was short lived as Naysmith`s side pounced on slack defending. The home defence failed to clear their lines from a free-kick and the ball fell to centre back Fordyce who showed great composure and skill to fire home the equaliser from the edge of the box. Things didn`t get better for the hosts as McMullan was sent off for reacting to a foul from Rooney on 35 minutes. The winger was fouled by the right back but raised his hands in retaliation. Referee Nick Walsh booked Rooney for his challenge and to the dismay of the majority of the 5842 in the stadium sent McMullan his marching orders. Little was created in the latter stages of the first period only a notable Dobbie shot from the edge of the box that spiralled wide of United`s stopper Harry Lewis` net. The referee blew for half time to a chorus of deafening boos from the home support, who felt McMullan`s deserved dismissal was unjustified. The Doonhamers had the majority of play in the opening moments of the second period. Good link-up play from Rooney and Dobbie on the right freed up space for ex-Terror John Rankin. Queens` captan picked up the ball on the edge of the box but in truth Lewis made a comfortable, routine save. The visitors continued to use the extra body to put pressure on the United defence. Evergreen Derek Lyle was fouled by William Edjenguele in a dangerous position. Dobbie`s set-piece looked to a comfortable catch for Lewis but after some pressure from Lyle he scrambled the ball into the strikers path. Despite having three chances to pull the trigger, Lyle couldn`t get an attempt away. Lyndon Dykes was next to be denied after Dobbie did well to find the Australian on the left. Dykes then curled an effort which looked destined for the top corner but Lewis once more saved the day with a superb save. The Doonhamers could smell blood but Dobbie`s effort from 20-yards was deflected out for a corner. From the resulting set-piece Dobbie tried his luck once more but his strike was blocked. Despite the several chances Queens made to go ahead they found themselves behind on 68 minutes. 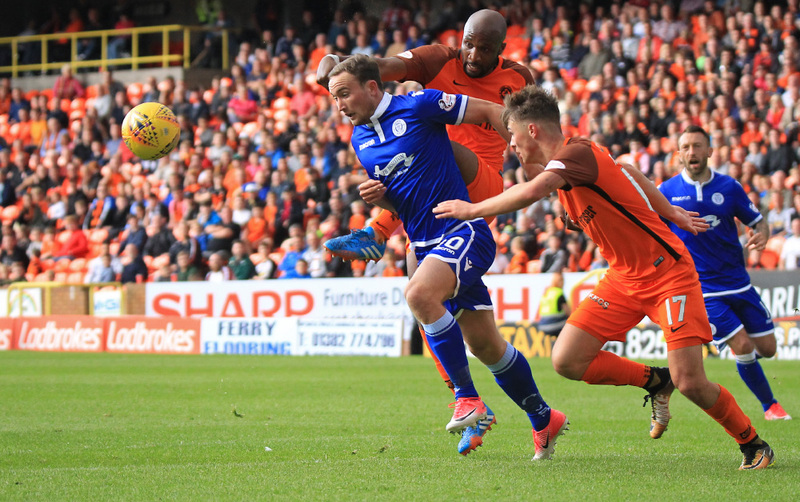 Substitute Scott Fraser received the ball from Billy King in the box and he made no mistake to fire the hosts ahead for the second time in the afternoon. It was a bitter blow for Doonhamers but they could have been level four minutes later when Dobbie`s clever through ball set new loanee Kane free but the forward`s attempt to slot the ball past Lewis failed with the young keeper making a superb save. Kane was in the spotlight once more when he went down after a challenge in the box. Referee Nick Walsh didn`t hesitate to book Kane for diving despite contact looked to have been made. Queens continued on their search for the equaliser and it nearly came from an intelligent long range chip but Lewis was on his toes and caught the ball at the last moment. With Queens throwing everything in the final stages, Marshall was next to have a shot but his low powerful drive was parried wide by the excellent Lewis. Queens may have lost against ten men but on another day, and against another goalkeeper, the side could`ve easily been heading back to Dumfries. Next up for Queens is an Irn-Bru Cup tie with League One outfit Airdrieonians at Palmerston Park on Tuesday night. Four days later Queens face off against Dumbarton in their next Championship fixture. 14:23 Dundee United: Lewis, Murdoch, Durnan, McMullan, McDonald, King, Stanton,Edjenguele, Robson, Keatings, Fyvie. 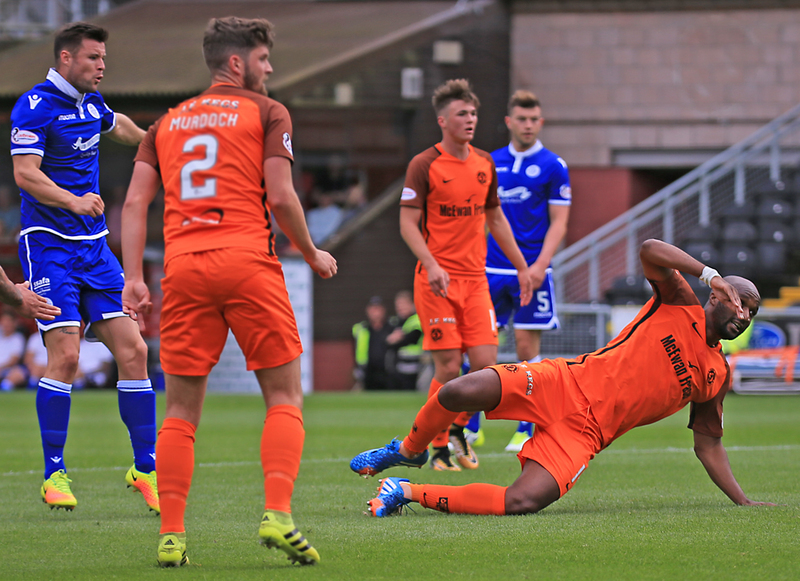 14:26 Queens were unbeaten in their two visits to Tannadice Park last season, drawing on both occasions. 14:28 Ex- Queens favourite Mark Durnan captains United this afternoon. 14:29 Martin recovers from the injury he suffered last week and starts between the sticks. 15:01 The teams are out and we are moments from kick-off. 9 min Lyle and Rankin on the floor at the moment after colliding with each other. Quiet start to the match so far. 11 min Queens win a corner after pressure from Dykes. 11 min Corner is too deep for Fordyce to connect with. 17 min Robson`s left foot shot cracks the post. 18 min McDonald taps home from point blank range to open the scoring. 25 min Rooney makes a superb run, crosses to Lyle in the box but his shot is blocked. Still 1-0. 29 min The ball falls to Fordyce in the box and he fires home the equaliser. 33 min Just to confirm its 1-1 here at Tannadice. 34 min Dobbie`s long range right footed shot sprays wide of the goal. 37 min Rooney is cautioned for a bad challenge but McMullan is sent off for raising his hand. Half Time All square here at Tannadice after an eventful half of football. Half Time McDonald gave the hosts the lead but Fordyce equalised for the Doonhamers. Half Time The teams are back out for the second half. 50 min Rooney and Dobbie linkup, frees up Rankin but his shot is well saved. 52 min Lyle is fouled by Edjenguele. 53 min Dobbie`s free-kick seems to be gathered by the keeper but drops the ball but Lyle can`t get his shot away. 54 min Dobbie lays the ball to Dykes and his shot is saved by the keeper. 65 min Dobbies long range right footed shot is deflected out for a corner. 66 min Dobbie`s shot is blocked again. 68 min Fraser gives the hosts the lead with a cool finish inside the box. 73 min Dobbie plays Kane through but his shot is saved by the oncoming Lewis. 74 min Kane is booked by the referee for an apparent dive. 76 min Dobbie`s long range chip is well held by Lewis. 86 min Marshall`s shot is deflected out for a corner.